The San Marcos Greenbelt Alliance board and trail crew wondered, too. So, when Rebekah Rylander, a doctoral candidate at Texas State, offered to lead a group of biology students in a three-month survey of the habitat we were eager to learn the answer. After obtaining permission from Bert Stratemann, Operations Manager for the San Marcos Parks and Recreation Department, Rylander set to work. In addition to the two city-owned natural areas, the Freeman Ranch, owned by Texas State University, was also surveyed. This property is at least twice the size of the combined green spaces and is not bordered by development. 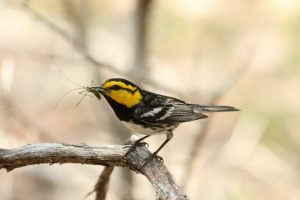 The Golden-cheeked Warbler (Setophaga chrysoparia, GCWA) is a small neotropical passerine that selectively breeds only within the Edwards Plateau Region of Central Texas. It is dependent upon large stands of mature juniper-oak woodlands that are typically located near or along canyon slopes. The birds use this habitat for nesting, breeding, and carrying out most foraging behaviors during the months of March – July. Due to habitat loss and fragmentation over the past 50 years, the GCWA was emergency listed as endangered in 1990 by the U.S. Fish and Wildlife Service. Since then, multiple conservation based institutions, organizations, military bases and independent biologists have dedicated their time, finances, and effort to studying and preserving this species. Even though research efforts have been fruitful and current GCWA population numbers appear stable, the warbler continues to suffer from, first and foremost, habitat loss and fragmentation, followed by other factors such as brood parasitism and predation, anthropogenic activities and noise, among other things. Nine separate surveyors visited the GCWA plots for both transects and territory mapping: undergraduate students Joseph Plappert, Jacob Weishuhn, Philip Doiron, Bryan Baird, Jazmyn Milford, and Rebecca Davis, and graduate students Sarah Durham and Rebekah Rylander, and independent party Colton Robbins. All surveyors were trained to identify GCWAs by sight and by sound (USFWS permits TE143922-1 (Bio-Spatial Services) and TE168189-0), and were familiar with transect and spot mapping techniques before official data was collected. GPS points were taken on various models of GPS units, but all were checked to be accurate and precise for the study. With over 300 hours of volunteer survey efforts, a total of seven unique GCWA males were detected during our southeastern Hays County surveys, two of those detections being on city property and five on university property. 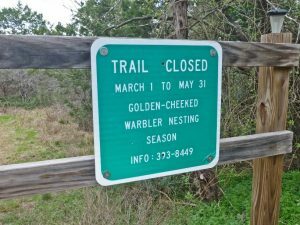 No GCWAs were found at Spring Lake Preserve. A total of seven different male GCWAs have been seen and heard singing during various parts of the spring and summer months in previous years. Based on the results, at least four of the seven males were detected during three or more separate surveys, which technically makes that an official territory according to protocol. The survey group was uncertain of the reasons for the individual males to stick around for a prolonged amount of time if they were not breeding, and they have a few hypotheses: there were females but they were unable to detect them, the males were young (after hatch year AHY) and were kicked out of more suitable habitat by dominant males, or food and other resources were abundant. It’s likely that none of the hypotheses fully explains the data; however, the data gives a better picture of the current use of these properties for this endangered species. In the coming 2018 season, Rylander is planning on performing the same surveys for GCWAs on university and city-owned properties.